Upon their first encounter, Abe Peck’s well-dressed appearance and cheerful demeanor was a shock to author Maya Ross. She had always envisioned Holocaust survivors to be emotionally-gutted individuals, and this man, who had lived so many years with horrific memories, seemed on the surface to be so intact. But as Peck (now 92) told her, Adolf Hitler – whose regime exterminated more than 90% of his circle of relatives and friends – would not have the last word. 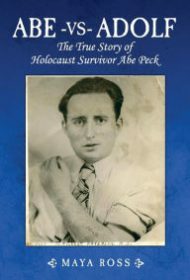 Peck was determined to survive in order to keep alive the stories of those who fell at Hitler’s hands. Ross’ book deftly captures the arc of Peck’s life from his youth in Szadek, Poland, through his torturous years in and out of nine concentration camps—experiences that are as painful to read as one might expect—followed by his post-war years when he emigrated to the U.S. and became a successful New Jersey-based businessman. While not as lyrical as some other survivor’s memoirs, such as Elie Wiesel’s, Abe vs. Adolf is as powerful as it gets when Peck describes how hate can pervade a society, enveloping its residents with a toxin as dangerous as the worst of pandemics. It is a worthy addition to the literature of the Holocaust.